Apple’s iOS 6 update brought a slew of new features but it’s the removal of just one app – Google Maps – that has ignited controversy and triggered an outpouring of customer criticism. The Google Maps app is (was) arguably one of the most used of all iOS apps, and by far the most useful and accurate mobile mapping solution on the market. Until the release of iOS 6, Google Maps had been a native pre-installed app on all iOS devices since the release of the first iPhone back in 2007. Rumors that Google Maps would be removed from iOS 6 first emerged several months ago, with reports that Apple intended on distancing itself from Google and its products. Whether this was a strategic move to avoid directing customers to Google services, or due to Apple wanting to take maps in a new direction is unclear at this point. Whatever the reason, Apple has made a critical error by removing Google Maps at a time when a standalone Google Maps app is not yet available. 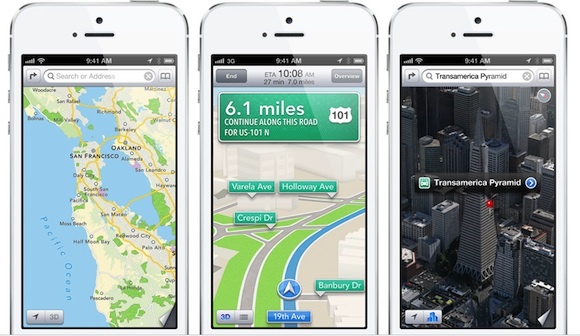 Apple’s Google Maps app replacement, Apple Maps, has been unanimously decreed a failure. The forced adoption of Apple Maps has triggered an intense backlash against Apple, with the new app lacking in vital Point of Interest information and plagued by inaccuracy. Apple have failed to realize that a mapping app will always be judged on its ability to find locations and get you from A to B. All the 3D rendering, voice-directions and fancy bells and whistles in the world aren’t going to change that. In response to the backlash, Apple have been quick to point out that users may use the “Report a Problem” feature to indicate issues with Points of Interest data to help them improve the accuracy of the app. However, the notion that customers should be responsible for bringing an inferior product up to scratch after a perfectly adequate product was previously available is reprehensible. For those holding out for a standalone version of the Google Maps app – be prepared for a lengthy wait. The New York Times has reported that Google is indeed working on the app, but it won’t be ready for “a couple months” yet. Have you used Apple Maps? How do you think it stacks up to the old Google Maps app? Share your experience in the comments below.